A few of you will remember that I ran a post a few weeks back on the Reactiv Cycling Jacket, an Dyson award winning design by Michael Chen from Middlesex University. I stumbled on a very similar project by Leah Buechley, a post doctoral researcher at the University of Colorado, Boulder. Leah's research interests are in a one of kind field called "E-Textiles", what she describes as an "intersection of computational and physical media, focusing on computational textiles or electronic textiles (e-textiles) - soft, flexible, fabric-based computers." Her research was the recipient of the best paper award at the 2006 International Symposium on Wearable Computers (L. Buechley, A Construction Kit for Electronic Textiles) and has been featured in the New York Times, Popular Science, CRAFT Magazine, the Journal of Architectural Design, the Boston Globe, the Denver Post and the Taipei Times. Wow, talk about publicity!! 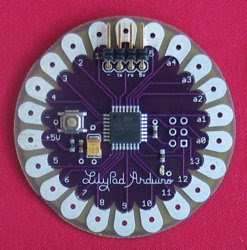 A "Lillypad Arduino" microcontroller for e-textiles, cooperatively designed by Leah and Sparkfun Technologies. 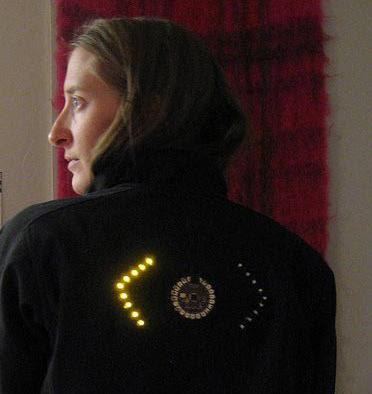 It can be sewn to fabrics and other wearables and is programmed with the Arduino software. Get this : They're even washable!! Well of course, you have to remove the power supply first! This is a great application to night riding safety. Whether she intends on making something commercially available to cyclists, not just in jacket form which may be unfavorable to some in hot weather, but also in a short sleeve jersey-like style, is yet to be seen. 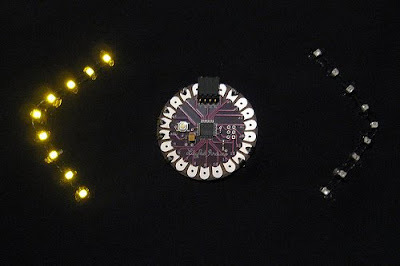 If you're interested, check out Leah's very educational material on how to make your own wearable LED display, something DIY you can get your hands into. This fascinates me! Here's a nice video from her showing how her design team programmed the LED shirt. Apart from all this, she has a host of other "wearable" projects displayed on her website. Leah is also involved with the Craft Technologies Group. She has developed "E-textile" construction kits called Quilt Snaps (IEEE,2005) through which she engages students in local schools in computing and electronics education. I don't deny it's a very interesting idea .... but I kept thinking Elvis when I saw the photo. For night riding, it'd be better to be a reflective white jacket. I'd rather be seen and able to hand signal.